Styled with the skater pant and chalet puffer . 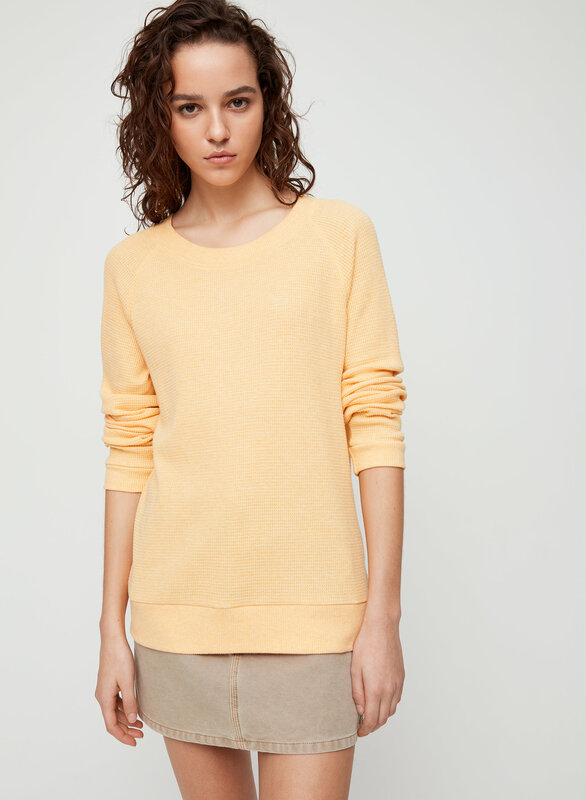 This is a waffle knit with a raglan sleeve and pullover silhouette. It's made with a soft cotton blend. This top is amazingly comfortable. I want one in every colour. The fit is perfect, everything is perfect. Very cute and cozy, but not too heavy. This top is my go-to for running errands on the weekends. I have the light gray and olive one and they’re both nice. Long enough to wear with leggings as well. I am typically a medium so that is what I ordered and it does have an oversized fit, I could have went to a small for something more tapered and still had it fit. I have this thermal in 2 colours and it's great! Winter or summer, jeans or tights - it's an easy fit into everyday wardrobe. I love this item, I wear it all the time! I had read reviews about the Andrews Thermal being a bit bigger in size, I found it was the opposite when I got my order. It fit smaller than I had imagined it to be, especially since I had ordered size small in other colours a few seasons ago. If you want it baggy, order a size up. I own 3 of these, they wash well and my go-to basic casual top to wear with my Alix pants. Great looking thermal. I love the material and fit. Size down if you want a tighter fit. Quality is very good and it washes well. Nice casual shirt! Long and comfy ..
Great fit dnd love the colour. Love the thermal especially for this time of year. It’s comfortable yet dressy for work. Really nice material! I have 4 of these tops and wear them all the time. Size down! Super comfy easy to wear! 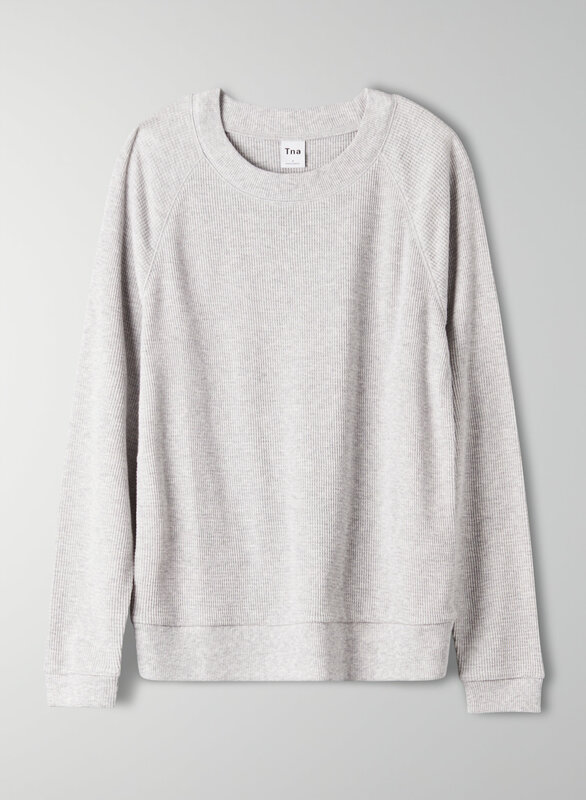 I have several thermals from Aritzia and the Andrews is my fave. I like it over some of the others (like the McKay or Alder) because it has regular sleeves that are at the natural shoulder. Great for layering. Loses one star for the bottom hem. Would prefer one that was wasn't so wide or if it was more cropped in the front and longer in the back. Washes well. Very good quality and very comfortable! Good to keep warm in winter also! I usually like relaxed fit clothing but this top misses the mark. The armpits are just way too baggy relative to the sleeves/body, resulting in a weird fit. The fabric is also not as soft as the description suggests. Though I will say that I did not feel the least bit cold when I paired this thermal with my wool Cocoon coat (at 0°C). The cut of this tee ran a bit big and the thickness of the material was on the thin side. Thermal tees should be plush to start as laundering makes them flatten. I am keeping them to hang out in but will not order more. I love these so much I have several in different colours! They are soft and comfy. Great to pair with jeans or joggers & sneakers.